Nathan from Stockmans Choice Free Range meats is one of the many interesting and friendly people I’ve met at the Cleveland Village Bayside Produce and Craft market in Bloomfield St, Cleveland QLD. It was with great excitement that I received a SMS text message from Nathan with an invite to a Christmas Party to which he had invited people he knew from the markets (customers and fellow stall-holders) and included a choice of fish, beef or kangaroo for dinner plus some wines and soft drink. The next Sunday markets I met Nathan and could tell straight away why Philip was so enamoured of him. Nathan is such a friendly, interesting man was proud of the high quality of the produce that he sold. So, on December 12th Philip and I caught a train from Cleveland, QLD to Murarrie (somewhat near Brisbane) and made our way from the station to the Murarrie Progress Hall. 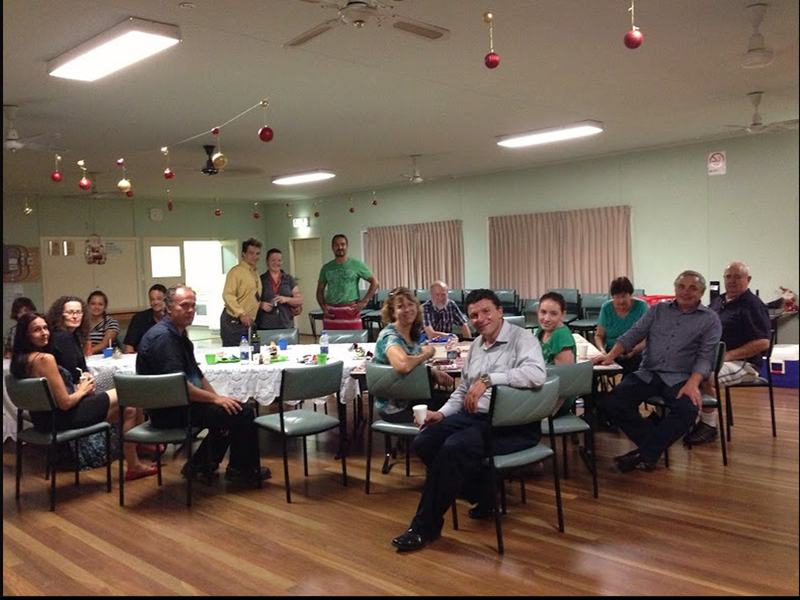 As we are somewhat new to the area (leaving NSW in November, 2011) it was great to ‘break bread’ with people and enjoy getting to know new people. Some I had met at the markets but hadn’t talked to in great detail. Nathan was busy cooking the meat and fish and was a most friendly and warm host. We had a great night and donated some chocolates to the ‘raffle’ which were warmly received. Nathan now works out of the Chandler Markets, quite a distance by train. I hope that someday soon we make the journey and catch up with Nathan and explore another famous Queensland produce and artisan market. I do so love the energy you find at such markets and the new products, tastes and smells to be found there.